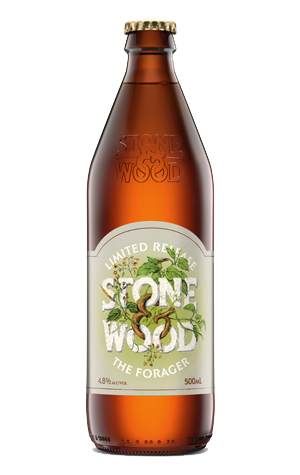 Stone & Wood has kicked off 2016 with a new beer that will be the first in an ongoing seasonal series. It's called The Forager and they say the inspiration, as for many of their beers, comes from their home turf in Northern New South Wales and "the search for wild food and a slower way of living". The intention is that each Forager will feature a different recipe that makes use of herbs and spices sourced locally. That said, while past releases – particularly under their Mash Collective side project – have plundered some very unique Aussie ingredients, for Forager Mk I there's a pretty traditional bent. Belgian witbiers are commonly brewed with the addition of citrus peel and coriander, and this beer is a Belgian style witbier featuring coriander and bitter orange. It pours with the pale yellow / off white, cloudy-to-the-point-of-opaque appearance typical of the style and offers up soft spice and lemon aromas. There's a prickly carbonation that brings the gentle citrus and sweet malt flavours to life, before it departs your palate with the refreshing gift of a slightly tart, dry and spicy finish.